The farmers in AP will very soon be producing electricity apart from their usual job of growing crops. 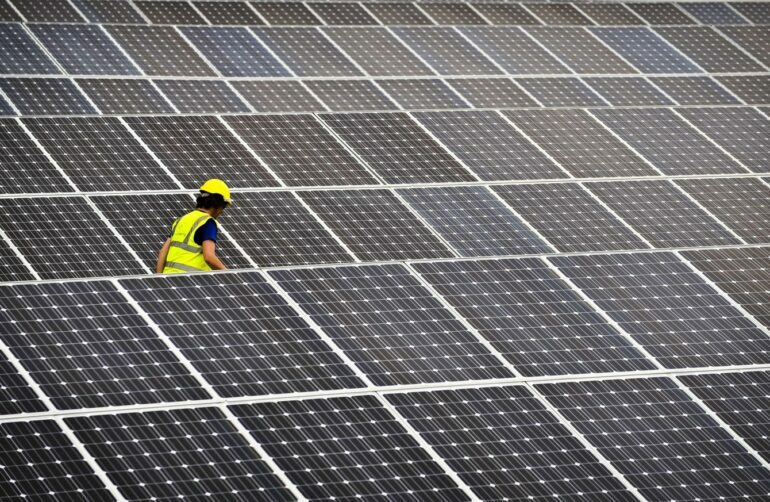 The SED (State Energy Department) is now set to be launching a scheme known as Solar Farming. It is actually the first time that such a scheme is coming to India. Under this scheme, the existing pump sets will be getting replaced with highly energy efficient solar pump sets, which will be enabling the generation of power. After making use of the power that is needed for drawing water to the field, the farmers can start pumping the remaining energy to the grid and by doing so, they can earn an additional income. A farmer can actually generate anywhere close to 9K units of power using the solar pump-set each year, which will take an average of around 300 plus sunny days. Ajay Jain, Principle Secretary of Energy & Infrastructure stated that his team will be fixing the price for this power after having a discussion with these power regulators. Farmers will be given extra income for the task that they are going to carry out. The Indian Government’s EESL (Energy Efficiency Services Limited) will be the implementing company for this particular scheme. Mr. Jain went on to add that EESL is now also preparing a very detailed project report regarding this scheme and he added that he and his team are now having talks with the funding agencies for assisting them with the money. He stated that there is a requirement of INR 3,000 crore for launching this scheme. Each of the five HP solar pump-set that had costed around INR 5 lakh initially is now made available for around Rs 3.25 lakh and this price is estimated to dip further. The Centre will be providing around 30 percent subsidy for all of these pump-sets. In its first phase, the Andhra Pradesh Energy Department will begin to replace nearly 1 lakh pump sets from the month of May this year. Mr. Jain stated that under this scheme, there will not be any cost for the farmer. An added benefit for the farmers will be that they will be making additional money by actually generating power apart from fulfilling the energy requirement. This is certainly going to help all the farmers in the state of Andhra Pradesh. This is honestly a wonderful scheme by the Indian Government and it has come in the right time as the farmers’ condition is pretty bad in India. These additional income earning opportunities are for sure going to change the life of these farmers for good.